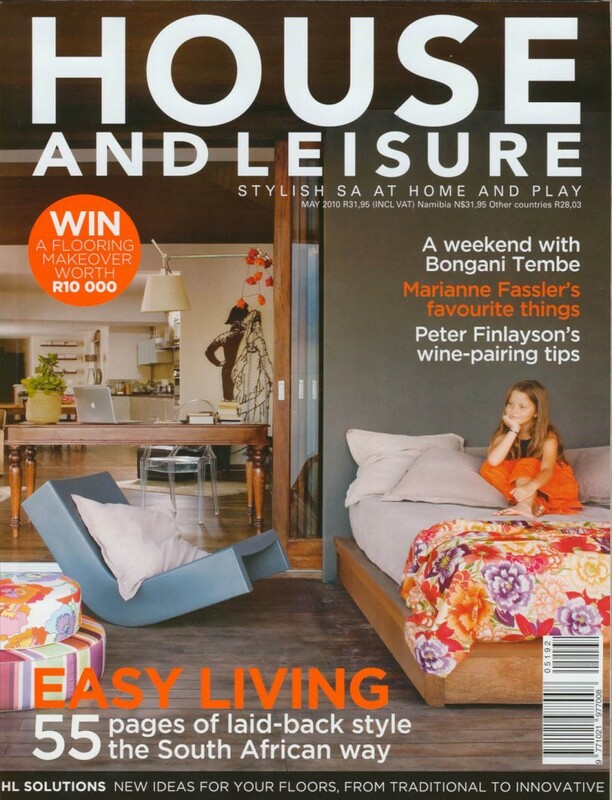 Another front cover for Jenny Mills Architect - this time House of the Month for House and Leisure Magazine May 2010. 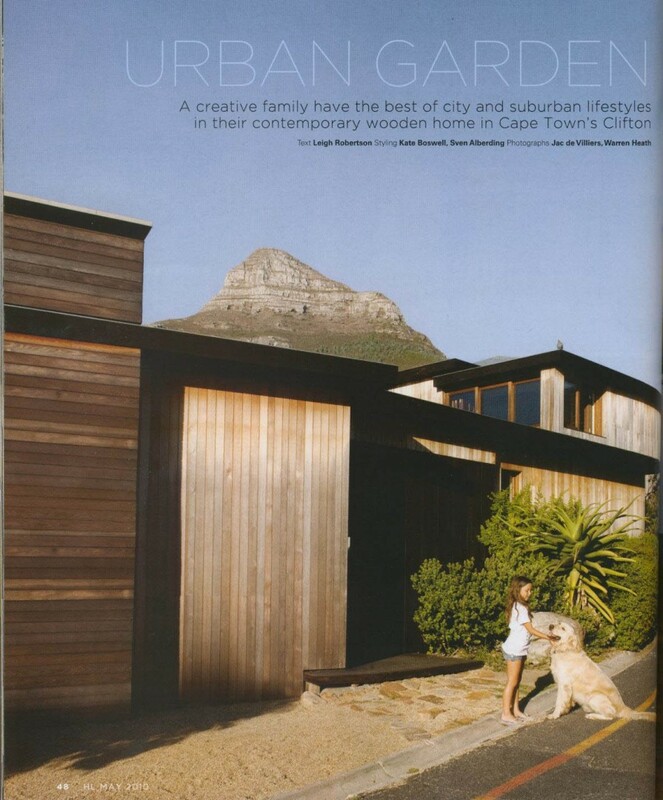 A creative family have the best of the city and suburban lifestyles in their contemporary wooden home in Cape Town's Clifton. The home was designed to 'sit in the landscape' as much as possible. 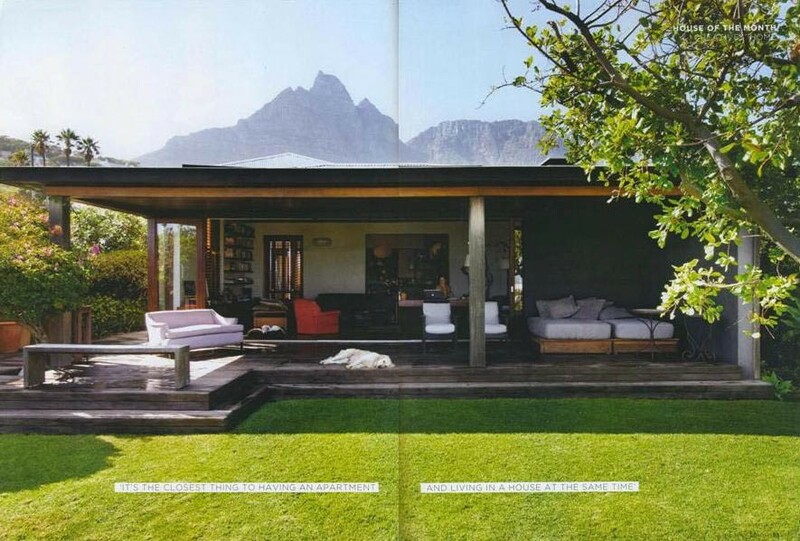 The couple loves the profile of the house, which includes a spectacular view of Lion's Head. 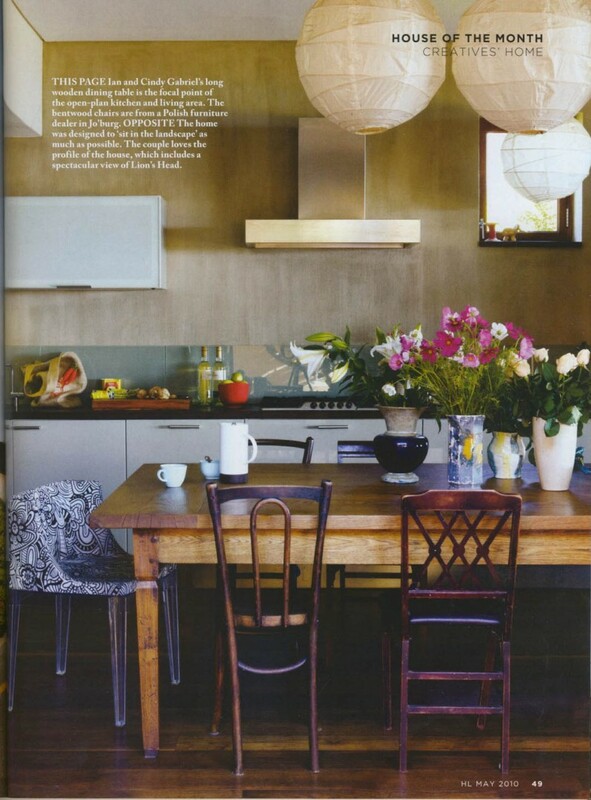 Ian and Cindy Gabriel's long wooden dining table is the focal point of the open-plan kitchen and living area. The bentwood chairs are from a Polish furniture dealer in Jo'burg. 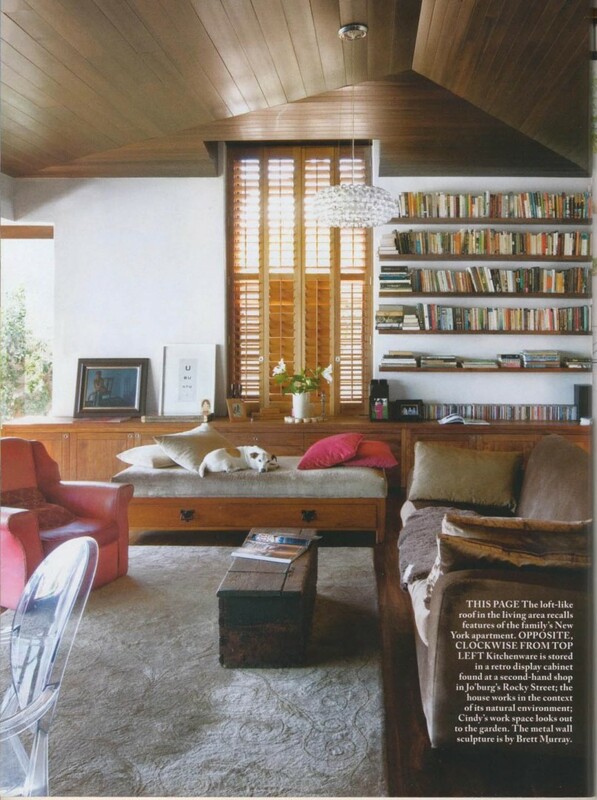 The loft like roof of the living area recalls features of the family's New York apartment. Some people are cut out for the quiet suburban life; some are resolutely not, like townies Ian and Cindy Gabriel, who thrive living right in the hub of things, whether in Jozi's Bez Valley, New York's Manhattan or Cape Town's Tamboerskloof. But this creative couple now enjoys the best of all worlds in their 'urban garden', off Clifton Fourth Beach. Just five minutes from town, where award-winning film and commercials director Ian and producer Cindy run a production company, their distinctive contemporary wooden house affords them privacy and plenty of room to breathe, as well as a closeness to their natural surrounds. Things they don't take for granted. The sea is right there, viewed through a soft fringe of palm trees and bougainvillea, while stretching above the roof is a panoramic mountain vista. Yet, unusual for Clifton with its closely arranged network of bungalows, there is a rather pleasant suburban feel. You might step into it directly from the street ('as you would an apartment': explains Ian approvingly), but the vast glass sliding doors of the open-plan living area expand to a surprisingly generous garden complete with lush lawn and swimming pool - where, Ian adds, there's a strategically placed step so you can loll in the water while looking up at the mountains. Though Ian and Cindy have their own work spaces in the house, it's essentially a family home, shared with their daughters, Sophie, eight, and Ella, 19, a performing arts student at UCT along with two dogs and two cats. This more secluded part of Clifton has a strong neighbourhood feel, and local children safely wander from house to house. It's also surprisingly peaceful; when the annual Moonstruck full-moon party took over the beach in late summer, they were only vaguely aware of a 'hum' in the distance. "ITS THE CLOSEST THING TO HAVING AN APARTMENT AND LIVING IN A HOUSE AT THE SAME TIME"
Top: Cindy's bespoke wardrobe takes pride of place in the master bedroom. A strategically placed, freestanding bathtub looks out over the rooftops towards the beach. Bottom: Sophie, like her older sister, has free expression when it comes to her bedroom. The budding art collection includes a portrait by John Murray. When they came across the property with its untouched old bungalow, they immediately saw its potential. 'What I liked about building here was reworking the spatial envelope of the previous dwelling without increasing its size: says Cindy. 'This was a major challenge when redesigning the space to create a spacious family home, but I think we achieved it in the end! Cindy enthuses about 'the beautiful slivers of mountain, sea and sky, unseen until you turn a corner and look out a window or past a tree'. Their collaboration with architect Jenny Mills resulted in a house that incorporates all the best features of their previous homes. 'It's the closest thing to having an apartment and living in a house at the same time: says Cindy. 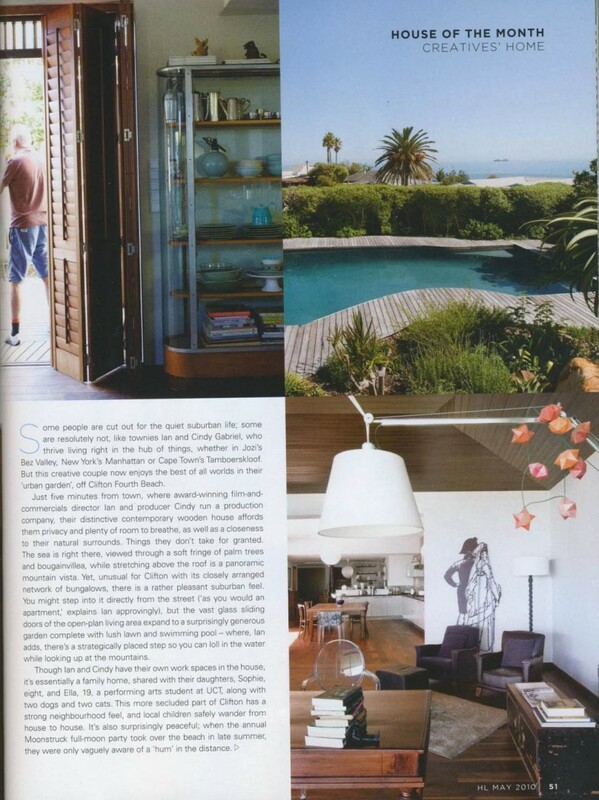 'Like we brought our Manhattan loft to Cape Town,' adds Ian, pointing out the loft-like roof and the large window in the lounge, a reminder of the 18 massive windows that ran the length of the Manhattan space. While still living in their Tamboerskloof 'urban farmhouse', the couple spent many design sessions with Jenny at their kitchen table. 'This was where we did our work, had our meals and entertained, so she made the kitchen the centre of the new house, as it had always been in our homes,' says Ian. The couple love to cook and can easily fit 14 friends at their long wooden table. Its mismatched chairs, as with many of the cherished pieces in their home, trace the family's migration from city to city. One favourite sofa, bought in New York, has been recovered three times. While it's clear this is a lived-in home where comfort is key, a stylish sensibility pervades, from furnishings upholstered in warmly hued velvets or love-worn leather, to occasional modern pieces. 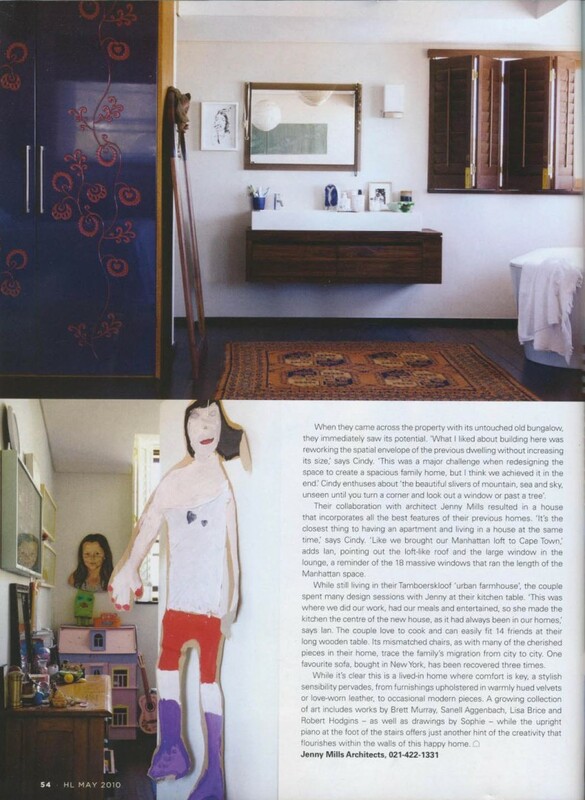 A growing collection of art includes works by Brett Murray, Sanell Aggenbach, Lisa Brice and Robert Hodgins - as well as drawings by Sophie - while the upright piano at the foot of the stairs offers just another hint of the creativity that flourishes within the walls of this happy home.